A number of years ago, aquarists discovered that using mangrove plants in their saltwater aquariums produced a host of benefits. Chiefly, the plants removed a lot of toxins, such as nitrates, phosphates, and dissolved organic content (DOC) from the aquarium water. In some cases, the DOC reduction was so great that a protein skimmer was no longer required. Using mangroves in your saltwater aquarium is easy, but it requires the right type of mangrove plants as well as proper establishment and care techniques. Mangroves are adaptable to many environments. In the natural world, they live in freshwater swamps and along brackish and saltwater shoreline areas. They have the ability to live in saltwater by straining the salt out of the water. The cells in their roots take in water, but because the root cell pores are so small, they do not allow the salt molecules to be absorbed. They're Nature's own little RO/DI units. Introducing mangroves to an aquarium is normally done by way of the seeds, which look like long pods that are fat at the bottom (root area) and skinny at the top (leaf growing area). Newly produced seeds float around on top of the water, drifting with the tides and currents until they finally come to roost. The seeds need only a short period of non-movement to start anchoring into the mud, sand, or rock structures they often get trapped in. Some suppliers cultivate and harvest mangroves from the wild, while others aquaculture them in closed systems. If you're buying mangroves online, check your local laws. Some U.S. states prohibit the importation of mangroves. If you will be in an area where mangroves are endemic and you wish to collect your own, once again make sure that you check the local laws first. Some U.S. states, like Florida, consider the mangrove to be a protected species and have laws prohibiting collection. Others, like Hawaii, consider mangroves to be a weed and may have little or no concern about anyone collecting or owning them. If you get seeds in the first or second stages, it will take a while for them to mature. Mangroves in the third stage have a good root start and will grow to maturity faster. In the fourth stage, you already have mangroves with an advanced root system, and you can generally see results in a very short period of time after introduction into the aquarium. Mangroves range in price from about $4 up to $25, usually based on the stage of seed you purchase and how they were grown. Check with your LFS (local fish store) to see if they have mangrove plants available, or purchase them online. Before buying mangroves, you need to know how to acclimate them. The biggest mistake that beginners make is to immediately put the mangroves into water and expose them to intense lighting, such as from metal halides, and hope for the best. This is a sure-fire course to failure. Mangrove plants received by mail order will more than likely have been in transit for several days without light, water, or CO2. The plants can literally be in "shock" when you open the package. Therefore, they should be slowly and carefully acclimated and introduced to their new environment. After shipping, sometimes they may even go through a dormant stage, but if cared for properly they will awaken from this dormant stage and continue to grow and mature. Hopefully, the plants you receive will have been well prepared for shipping. This is best done when the leaves and roots are wrapped in a damp water-absorbent material (paper towels or newspaper) and sealed in a plastic bag. When you receive the plants, remove them from the shipping material and gently rinse them in room-temperature fresh water or tank water. This will remove any extraneous contaminants and allows the plants to "breathe" and adapt them to their surroundings. Let the plants sit in the room temperature air, following the plant supplier's recommendations; this is usually about 1 hour. Finally, place the plants into their new home. The method most often used for keeping mangroves is to place them in a sump. A refugium also can be used. The seeds are inserted into pieces of styrofoam and floated with the roots in the water, then they are provided with a plant light source. Some aquarists also suggest an iron supplement. 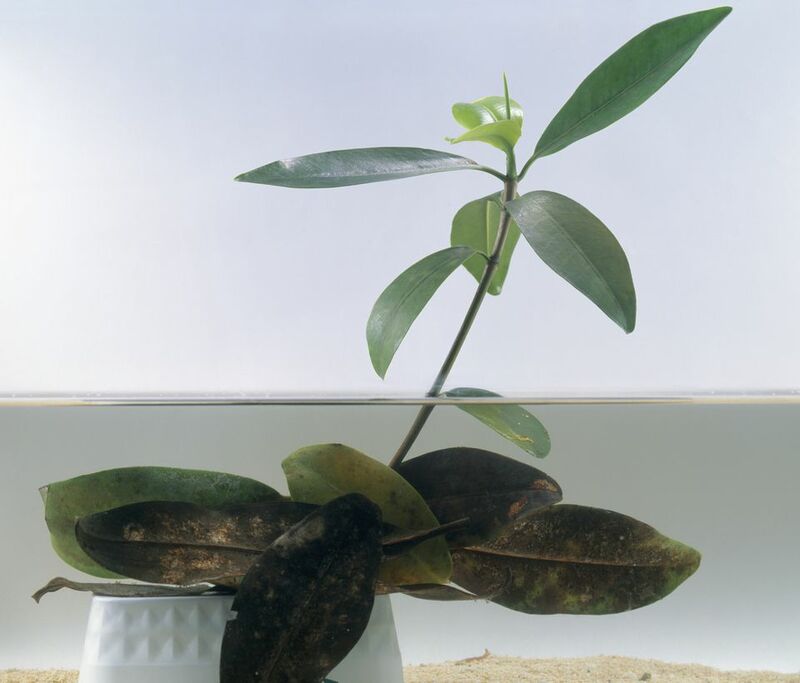 If you don't have a sump or a refugium, you can place your mangrove plants directly into your aquarium by submersing the root systems in the tank water (after the plants are rinsed and acclimated). Be sure to keep the leaves above the tank lights, and try to limit their exposure to light for the first few days or a week. Often, they can thrive with just the ambient tank lighting, without a separate plant light or iron supplement. If you are concerned that your plants may not be getting the light they need, add or increase the lighting gradually. A 40-watt plant light will be sufficient. Don't place the light too close to the plants, as this can fry the leaves. As a test, put your hand between the light source and the tips of the leaves. If you can feel the heat, the light is too close.